The Boalsburg Farmers’ Market is proud to announce that SNAP EBT (Supplemental Nutrition Assistance Program) are now accepted at this local year-round market. This program allows SNAP customers to get fresh local fruits and vegetables along with baked goods, eggs, plants that produce edible foods, honey, meat and more. It is an all around win for the market, consumers, and farmers. “We will be the first farmer’s market in Centre County to accept SNAP benefits, but we don’t want to be the last. We are hoping that our program will serve as a successful pilot for other area markets. The goal is that everyone in our community will have equal access to healthy, local foods”, says Sarah Potter, who works with the market to do programming and outreach. If a customer plans to use SNAP/EBT, they will pick out their items at each vendor’s table, take their purchase slip listing those items to the Boalsburg Market information booth. There they will pay for the purchases with their EBT card. This process can also be used with debit/credit cards for vendors that currently don’t have a way to accept these forms of payment. After a customer pays with EBT or debit/credit, they will take the purchase slip marked “paid” back to the vendor to exchange for their items. The SNAP program is partially funded through a USDA Farmer’s Market Promotion Program grant that Boalsburg received in 2014. The grant funds have been used to increase market programs like cooking demonstrations, school programs and now SNAP. Additionally, the local non-profit, Spring Creek Homesteading Fund partnered with Boalsburg Farmers’ Market to apply for SNAP eligibility. Spring Creek Homesteading will continue to support the program and this will also allow the Boalsburg SNAP program to apply for future funding to ensure it’s success. “The biggest hurdle is getting the word out in our community and encouraging folks to make a point of shopping at the market each week. You can even use SNAP EBT to purchase a Community Supported Agriculture (CSA) share or weekly box of vegetables from a local farm. We want everyone to take advantage of the excellent local foods available at our market, and we are very happy that we can now expand that access,” says Potter. The ​Boalsburg F​armers’​ M​arket is open ​every ​Tuesda​y from 2:00-6:00 p.m. 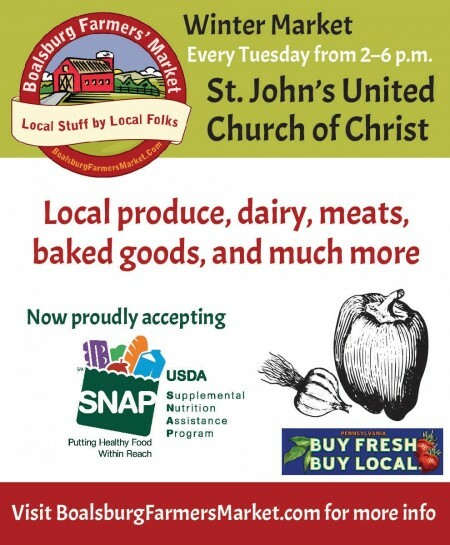 The current winter market is at St. John’s United Church of Christ, 218 N. Church St. The summer market is held at the Pennsylvania Military Museum Parking Lot. Parking at both locations is free. The CATA B bus also runs regularly to Boalsburg. Visit Boalsburg Farmers’ Market on Facebook or BoalsburgFarmersMarket.com for more information.